In 2010 I reviewed the Feickert Woodpecker here, and completely fell for its combination of sound quality and ease of use – so much so that it became my go-to turntable from the minute it arrived here. All good things come to an end, but instead of taking away the Woodpecker Chris Feickert persuaded me (hah!) to take its big brother – the Blackbird – to see what happened when the concept was taken further. 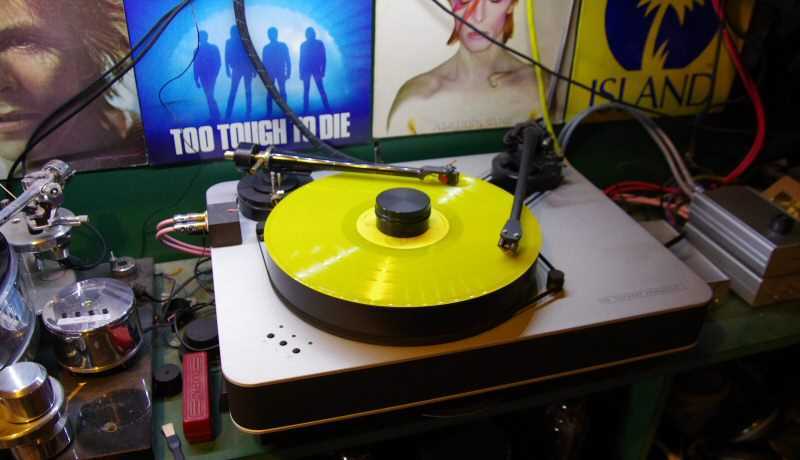 Of course I jumped at the chance and now said turntable has been gracing my system for the last 10 months (I know – sorry Chris), though in fact its stay has not been quite so seamless and easy as its smaller cousin – more on this later. But the reason I wanted to try the Blackbird so much wasn't because I thought it might be an improvement on the Woodpecker, but rather because it is a two-arm turntable. I've always wanted to get my hands on a two-arm turntable – the simple reason being that the ability to mount two arms is a reviewers dream. Take two arms and suddenly, with the flick of a switch you can directly compare two arms on exactly the same turntable and exactly the same situation (especially if you have a a Lehmann Black Box twin!). Many has been the time when this would have helped me separate out minor differences between components. But of late I've started to think that a two arm turntable has one other big advantage – cost. Now bear with me on this. 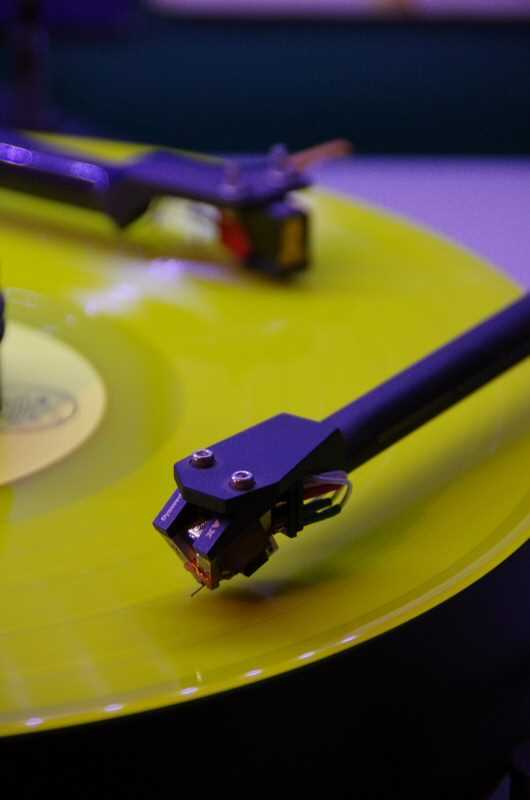 First - anyone investing in a 5000+ Euro turntable and arm/cartridge to match will not be short of cash, but many will still be on a budget and here we come to one of the rarely spoken truths of analogue – running vinyl can be VERY expensive. I'm not talking about purchase price, but running costs. Think about it for a moment. Let's assume you've got that 5000 Euro turntable and say 3000 Euro arm. That's a perfectly reasonable balance and you'd expect something of that quality to last many, many years. The snag is the cartridge. With that sort of front-end you are probably going to use a moving-coil costing 1000 Euro+. If you are really keen it'll be multiples of this. That cartridge is going to be just a little off-the-pace at something like 600 hours, so if you want to keep optimum performance you are going to have to replace that cartridge after 1000 LP plays. Each play costs 1 Euro. If you are into real exotics like the Dynavector XV-1t I have here that figure is going to be nearer 8 Euro. I'm sure I'll get emails from people running cartriges with 5000 hours on them, but sorry - here I can hear cartridges getting 'fluffy' especially on inner grooves, at little more than a 1/10 that mileage. Now you've picked yourself off the floor can I suggest a solution. How much of your listening is 'quality critical' as apposed to background, or party, or (God forbid) when your children touch the hi-fi? Personally 80% of the time I could live with a bit lower fidelity. Now one solution, assuming you have the space, would be something like a Rega Planar 2 and just use that – fair enough, but the sound quality, and perhaps more important the balance would be well below the full-fat turntable. 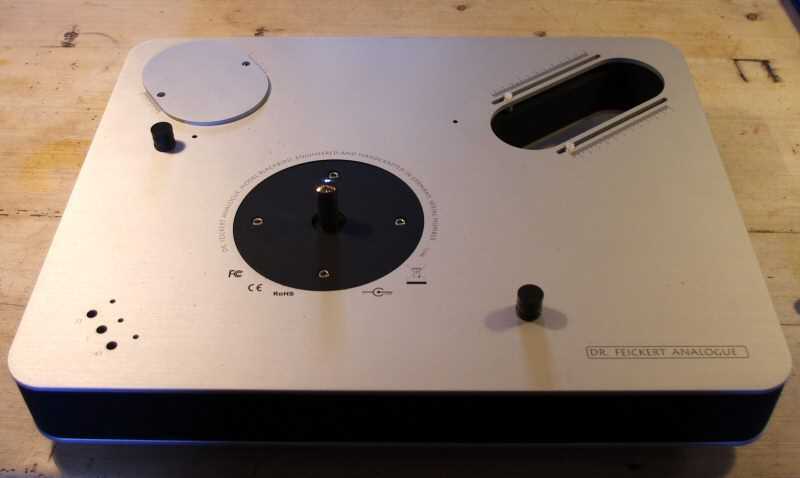 But if your exotic high-end turntable (and I'd class the Woodpecker as that despite its simplicity and cost) could take a second arm then a decent budget arm – a Rega RB 250, or something second-hand – could run with a good 200 Euro MM cart and two birds (Blackbirds?) would be killed with one stone. Or... Maybe for certain records you need the excitement of a Decca, or maybe a lot of your collection is Mono? There could be any number of reasons why someone would want two arms, and it makes sense to have them on one turntable rather than on two. Forgive me if for this section I refer you to the Woodpecker review because the construction is identical – that is but for three features. The first is the increased size to cope with the second armboard of course, the second a new bearing and lastly (and most interesting) the provision of a second motor. The new bearing is similar to the old but for much of the bearing shaft length there are what appear to be grooves machined around the shaft. The purpose I suspect is to 'hold' more of the lubricating grease and at the same time reducing the actual contact to two sections of the bearing shaft. The second motor takes advantage of the extra space on the top-plate and of course it offers considerably more torque (not that the Woodpecker motor lacked it) and the second motor also acts as an energy store/flywheel so that speed stability should improve. What is less commonly known is that such a design greatly reduces the falling moment on the main bearing. On a single belt-drive motor/pulley turntable the motor is inevitably set to one side of the platter/bearing assembly and depending on the tension on the belt this will pull the bearing quite hard to one side and that 'tugging' will vary over time. This is obviously a 'bad thing' as such a bearing works best when loaded vertically (by the mass of the platter); with no side force*. Placing a second motor (or indeed pulley as on the old Lurne turntables for example) diametrically opposite the first means that the forces acting on the bearing cancel each other out as each motor is pulling in opposite directions. The result should be a quieter and smoother running bearing and lower bearing wear. There is though – as so often the case – a quid-pro-quot, in fact two. The first is that the single biggest source of noise, both mechanical and electrical in a turntable is the motor. Add a second motor and potentially you double this problem. In theory the motor, if sharing the load, will be working less hard and so the noise of its working will be less, but there's no getting away from the fact that an extra set of bearings are spinning as are a load of coils. The second is motor position. If you look at 99% of turntables you'll see that looking from above the motor is positioned either at 8 O'clock or 10 O'clock. On a traditional rectangular turntable these positions are where there is space on the plinth (the 9 0'clock position being squeezed by the platter). But the reason why these continue to be the place in most turntables, plinth or otherwise is because the motor needs to be as far away as possible from the tonearm base (so mechanical noise passing into the arm from the motor is minimised) and at the same time as far away from the cartridge as possible as it sweeps across the record so as to minimise any interference – a mass of coils whizzing around just below a moving coil cartridge isn't a brilliant idea. Looking at the pictures of the Blackbird clearly illustrates the designer's dilemma. Whereas the Woodpecker has its motor conventionally mounted at 10 O'clock, the Blackbird has two motors and placing one at 10 O'clock means that the other has to be at 4 O'clock – directly underneath the cartridge of the main arm. Not only this but the motor at 10 O'clock is mounted hard by the base of the second arm! So from a best position for the Woodpecker the Blackbird is forced to adopt the two worst positions! The question is – do the advantages of two motors outweigh the disadvantages? I love this turntable. 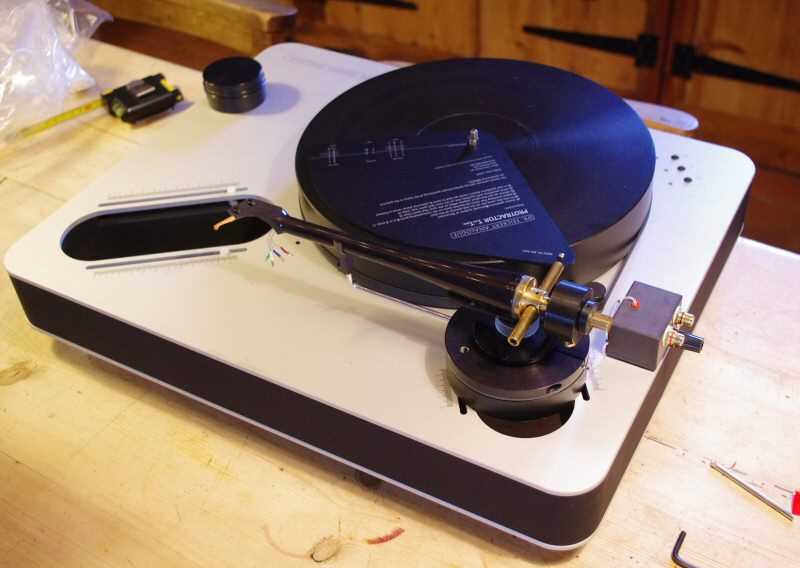 It's easier to set up than a Rega Planar – place the turntable on the shelf, drop the platter on the bearing, level it using the feet and then mount the arm. The same armboard with its sliding mount seen on the Woodpecker is retained for both mounting points (though only the main one is long enough for a 12” arm) – so with the supplied protractor it really is simple to set the arms up and small variations are easy and repeatable. But as I mentioned at the beginning, things now went a bit pear-shaped. After a week or so of use I noticed some wow on recordings that steadily got worse. Now the Woodpecker was beyond reproach in this so I was really surprised. I hate this sort of thing – I faffed about with phono stages and cables and even suspected valves and then realised that it was only when the SME v12 swept past a certain point the the noise started. Great! Now my main review arm's knackered – what had I done to it in swapping everything over to damage the arm? Wiring was first suspect so I checked as best I could. A bad earth in the arm maybe – the turntable electrically isolated the arm (plastic armboard) so maybe that didn't help, but then it'd been fine on the identical armboard on the Woodpecker. I tried two different arm cables – no joy. Did the SME earth through the bearings and was there a problem there? I'm not very good at all this and walked away from it in some annoyance. In the end I decided to return the arm to SME and put the review off. As I opened the SME box to pack the arm I noticed the SME arm-cable nestling there. I'd not used it because it was a bit susceptible to 'hum' and that's a plague in my house. But as a last resort I tried it and problem solved. Now think about it. I'd tried two different arm cables with different plugs. The V12 had crackled at the same place with both, and as the arm cable is a plug-in - well away from any influence the arm movement had - how on earth can that cause a problem! The only thing I can think of is that the two non-SME DIN plugs were not a great fit and so the contact was marginal – then this coupled with the dodgy earth connection to cause a problem whereas a decent contact was just fine. Mad? Yes but I can't think of any other reason. This all typical of the sort of thing that happens in hi-fi, when you test a faulty component umpteen times and find the thing causing the problem is a weird combination of two faults that on their own don't matter. Only my Lotus is as baffling. But then, I drew out of it's tissue-paper nest a little jewel – the Audiomeca Septum prototype. As readers will know, I followed the development of this arm and the matching 'Belladonna' turntable and used the close collaboration with Pierre Lurne to learn a huge amount about turntable design. As our relationship developed Pierre began to use me as a sounding board for his ideas so that at times I was the practice-wall to Pierre's forehand topspin. My actual creative input was zero. I wrote the articles to be found here which are essentially Pierre's take on what makes a top turntable - and in return for his patience and insight I translated the press release for him – it was a labour of love. Because this association went well beyond what a reviewer for TNT should do I promised Lucio that I would not do any sound reviews of Lurne equipment and that the connected articles would be technical in nature. A year or so later I was surprised to receive a package from Pierre and a note of thanks - in it was the original Septum prototype with his apology that it wasn't as well finished as his production arms and lacked a arm-lift. It is my proudest possession. This Septum has been used on some turntables (including the Woodpecker) and quietly helped in reviews, but now after 5 years I can show it in full glory on the Blackbird, because it was the arm above all others that I wanted to fill that second slot;-) Pierre Lurne is now in retirement and no, you can't buy a Septum so don't ask – and this particular one will never be for sale. So now, in safety, I can say it is the the most musical tonearm I have ever heard. So from the outset the Blackbird was equipped with two of the finest arms that money can – (or cannot) buy. Both single piece arms, one gimballed the other a unipivot. Cartridges – well the V12 just had to have the Dynavector DRT-1t fitted, it's been my reference for some time, and matches the V12 beautifully. The Septum is worthy of the same cartridge with which it works wonderfully, but it also (unlike the V12) is very happy running the high compliance Music Maker Classic – Len Gregory's oddball, plastic, giant-killer. The SME/DRT combo then went via the ESE Nibiru to my Ayon Audio Crossfire and thence to my Loth-x Polaris and REL Stentor. But to make the full use of the two-arm philosophy the Septum/Music Maker used the Graham Slee Revelation. Now you can see the two-arm philosophy writ large. On the first slot goes a high-end, no-holds-barred arm, moving-coil cartridge, and phono-stage combination – in the other an oddball arm with a much cheaper and more economic cartridge (only a couple of hundred quid for a rebuild) and into a phono stage with variable curves to optimize records with, shall we say, a loose relationship to the RIAA curve. First the technical stuff... One reason for choosing the Music Maker was that it had proved highly susceptible to motor interference, generally in the form of a steadily increased hum as it approached the motor position. My fears for the electrical interference of those two motors was squashed at a stroke. No hint of the dreaded hum or indeed any motor breakthrough for either arm combinations despite the two motors and the less than ideal motor positioning. To put that in perspective the utter silence of the Woodpecker had made me acutely aware of the feint motor hum of the AS Solid Machine and the slightly louder interference of my own Opera LP 5.0 turntable. The Blackbird matched the deathly quiet of its smaller sibling – no, I think it was even better - bravo! So within a few minutes my worries about the downside of the two-motor format were banished – it really isn't an issue. But did the hoped for advantages of the two motors show themselves? 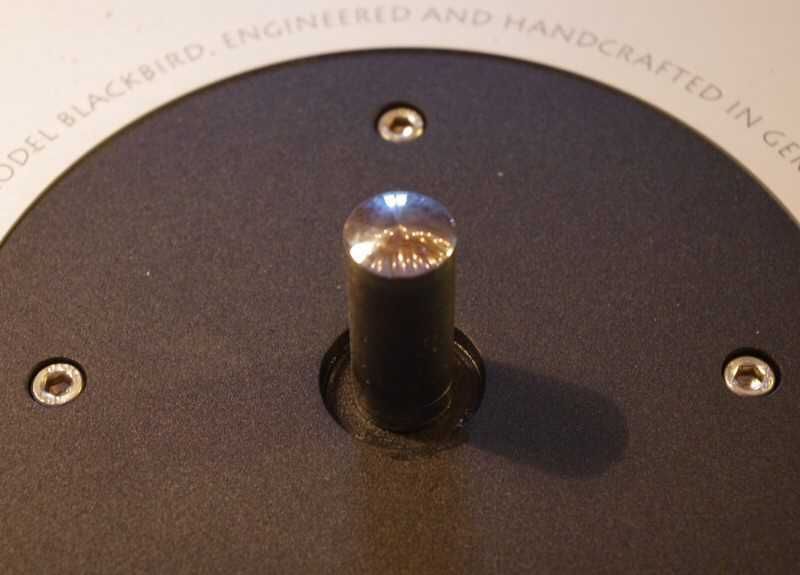 If I was comparing the Blackbird to any other turntable I would have said 'yes quite obviously' – but I wasn't comparing it with other turntables, I was comparing it with the best I'd heard in these technical areas – the Woodpecker, and that is a lot more tricky. When the reference has convinced you with its silent drivetrain, its utter stability and faultless operation it's hard to see where the Blackbird could improve. The Blackbird easily matched it, and the zappy start-up always made me smile, but better? Perhaps there's a technical superiority but to these old ears the two turntables sound so rock solid I thought them impossible to split in this respect. Sadly I'd had to use the same platter on both so back-to-back work wasn't possible, but if I didn't notice a difference then for me the difference wasn't important YM(and ears)MV. So technically not a lot to add so I just got down to playing with my new toy, swapping arms at will and generally having a ball. I've a copy of Elton John's 'Yellow Brick Road' on yellow vinyl. It sounded wonderful on the V12, but a bit thin. Swapping over to the Septum and fiddling with the Revelation RIAA setting and it came out with much fuller more realistic sound. True the ultimate fidelity wasn't as good – not so much detail or the (incredible) depth in 'Funeral for a Friend' but more pleasant to listen to. This sort of swapping went on a lot – I put the stylus guard on the XV-1t when the kids came home from school and let them still use the stereo (they are pretty good/scared though). If we assume that the SME and Audiomeca arms are about the same cost we are still left with a gulf in the total price of the two arm systems (systems being arm/cart/stage) with the SME befitting from components costing >5 times those used with the Septum down the chain. With that you'd also expect the SME to have a clear lead, and there is no doubt that the combination has the most glorious, rich, detailed delivery that is the closest thing to live music. The ability to draw a pure musical event with a realistic soundstage populated with big, tactile players is still something that surprises me when a record capable of the trick is put on. I'm currently going through a Miles Davis period and you need a system that brings out the texture of Sax and Cornet to make it really make the hairs stand out on the back of your neck (and allow you to ignore the crude stereo). What is a surprise is that the Septum system gets so close – you'd really need to listen hard to see what you are missing. The presentation isn't as rich and mellifluous but then the ear does adapt quite quickly to that – after which the ability to drag detail out and present it without taking the music apart is lovely. My wife (who is the main catalyst for the 'Miles' period) actually made me take my new copy of 'A Kind of Blue' off one turntable because it was too 'rattly' – she was quite happy with the Septum system but loved the SME and so, inevitably, we sat on the sofa and used the expensive kit that evening... But the next day, music on as we busied round the house, you wouldn't have been able to tell them apart. However there is one aspect that did catch my ear. On records that live and die on timing – and 'Take Five' was the first to show it – I had the distinct impression that the turntable was running fast. On checking I found this wasn't the case. Once identified such a characteristic requires investigation and I spend many a happy hour swapping records between various turntables and came to the conclusion that rather like the Roksan Xerxes the Blackbird managed to inject 'pace' into music, the difference as that the Xerxes ran slightly fast! The Blackbird is less frenetic but after listening to it in isolation it began to make other turntables sound as if the music was dragging a little. Is this important? – last week I was listening to some three-piece playing blues. There was no drummer and the bassist was therefore on his own in the rhythm section. He had all the moves, but the set was terrible – the music dragging and plodding, the whole thing loose and messy. In the end I came to the conclusion that it was a combination of two things - the bassist playing fractionally behind the time and the PA (which was terrible) was playing the 'bloom' of the note rather than the leading edge. The Blackbird obviously gets that leading edge and places it spot on time because everything seems so right - it is an essential attribute. Even allowing that the improvements over the Woodpecker are ones of degree rather than fundamental the Blackbird still makes a very strong case for itself – In theory, having a second, unplayed arm mounted on a turntable should actually reduce the performance of the main arm as it is made of a load of resonant components not doing anything - that the Blackbird manages to overcome this and even outperform the Woodpecker is wholly commendable. In theory leaving the second slot void would improve the quality even more, but I honestly can't see anyone running the Blackbird like this, even if their first intention was thus, simply because the second arm is so useful. Time to move on - as in the introduction, one raison d'etre for a two-arm turntable is to have a second, much cheaper front end. So the Septum went and in its place came the Audiomods arm – this costing a little more than 10% of the V12 and the Dynavector Karat D17 - again just 10% of the DRT-1t – in total circa 1500 Euro. Is there no limit to the Blackbird's talent! 12” arm, Two arms and now 78's! And of course what a great idea. 78's are coming back into fashion, and are even back in production, but require a different cartridge/stylus and of course a different phono stage. Most 78's are now played using RIAA standard phono stages which is one reason we associate them with a very unbalanced sound. Of course the Revelation will produce the correct replay curve with the flick of a couple of switches! Did I use it? I came THAT close. I borrowed one of my Father-in-Law's 78's ('Woodman save that Tree'...) and was on the point of lowering the Music Maker into the groove, but I just couldn't bring myself to drop that expensive shard of diamond into the hurtling lump of shellac with its furrow-like grooves. Coward? Yes... But for those who want a turntable to do everything, and everything supremely, then here is the answer once again. The second arm could be an old Decca, or SME or whatever, with a proper 78 cartridge mounted and running into the Revelation. Or perhaps best of all, with the no-hold-barred arm in the No1 slot, use an arm with an SME type headshell in it for the No2 station – then you can swap between a moving-magnet and 78 stylus in moments? How many other turntables will allow this? Right now most 78 lovers run an antique, vintage or something like a Rega 78, but none of those are going to give the quality of the Blackbird or the convenience of one turntable to do all. So no review of 78 playback quality, but one day I might get round to it! So I'm hooked. I never expected having two arm systems to be so addictive – now I drive my wife nuts by playing half a track and then swapping arms to see what it sounds like. And yes, as a reviewer's tool it is a dream – the two arm positions seem to be equally effective and the ease of set-up (again) applies to both positions. Yes there are a few other two-arm turntables, most of the round, plinthless variety which just allow another arm-pod outboard – but none look so integrated and all are big. And before you ask, yes you can actually have both tracking simultaneously and switch between them, but though impressive you can hear the other arm playing – rather like vinyl pre-echo - so it's a party trick rather than anything serious. As with the Woodpecker, my own turntables have been lying fallow whilst the Blackbird has been here, but with that small but significant lift in sound quality in the Blackbird, I think I've finally found a match for the Clearlight Recovery I tested 11 years ago and have missed ever since – I think that says it all. *On a suspended turntable where the motor is mounted off the sub-chassis this can also tug the whole chassis toward the motor, exciting the chassis to start bouncing in a non-vertical manner however this isn't an issue on a solid plinth design like the Blackbird. Speakers:Loth-x Polaris and REL Stentor.